Greek Chic: Ready to Pledge Beyoncé Delta Kappa? Beyoncé performing onstage during the Coachella music festival April 14, 2018, in Indio, Calif.
Bey Phi Bey! 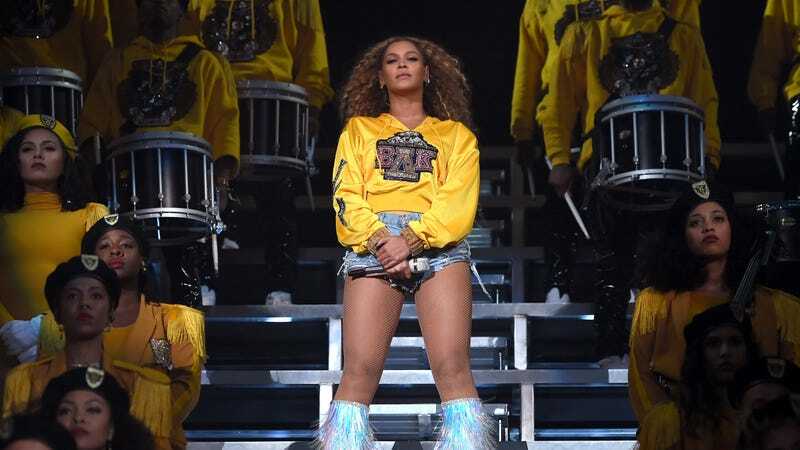 Last weekend, members of the Beyhive were delighted to discover that they belonged to an actual sorority/frat when Beyoncé staged the best HBCU homecoming ever during weekend 1 of Coachella. And just ahead of her much-anticipated encore during weekend 2, the Queen has opened her own pop-up store full of Greek-themed gear for her legion of faithful pledges. Available for the next 32 days, this 15-item capsule collection is available only on Beyoncé’s site and includes coed-friendly staples like hoodies, bandannas, tees and shorts perfect for pledging your eternal devotion to Big Sister Bey. As for your organization’s colors? Bey kept it basic with crimson, ivory and black, with a dash of that fantastic marigold that had us all dazzled Saturday night.